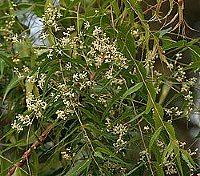 Neem (Azadirachta indica) is a rather amazing oil, not as well known as it should be considering its usefulness. With excellent moisturizing qualities, Neem oil is becoming increasingly popular in many body and hair care and pet products. Neem oil contains compounds that have both insecticidal, antiseptic and medicinal properties. It is a dark, rather sludgy green in color and has a strong, (not terribly pleasant) odor. Being both high in Vitamin E and fatty acids, Neem oil is said to be useful for treating a variety of skin problems such as eczema, psoriasis, acne and dry skin. In addition, Neem has a long history of use as an insect repellent and is increasingly being used to control plant pests and diseases. Neem oil has been studied and shown to be effective against mosquitos, flies, sand fleas, ticks and more. Read more about how to use Neem oil in your garden here. Note: Neem oil is thick, and can solidify at room temperatures. If that happens, place container of oil in warm (not hot) water and heat gently. Add to 1 pint water and shake well. Place mixture in a spray bottle and use as extra protection before walks, outdoor exposure etc. Review: Ordered 8 oz. of neem oil for $15 including shipping with a 15% off coupon. Shipped super fast and the product is very high quality. Will be ordering this product again, very happy!